Katrina Navickas speaks at Chartism Day 2016. 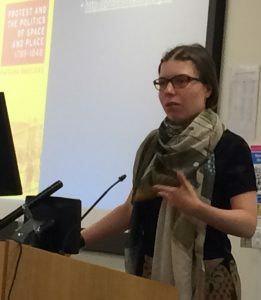 Dr Katrina Navickas is the author of Protest and the Politics of Space and Place 1789-1848. She is senior lecturer in history at the University of Hertfordshire and Director of the Centre for Regional and Local History. In 2015 she was a winner of the British Library Labs competition, working with the Digital team at the British Library to develop the Political Meetings Mapper. Mark Crail In combination, Protest and the Politics of Space and Place and the Political Meetings Mapper open up a new approach to the study of Chartism. Could you tell us a bit about how this approach originated and what it brings to our understanding of Chartism? Katrina Navickas My approach to Chartism and other socio-political movements in the nineteenth century is what you might call ‘spatial’. I’ve always attempted to find out the history of where political groups met, and why they chose particular places over others. I’m also interested in contemporary debates about the privatization of public spaces by both private companies and the government. I see quite a few parallels in the ways in which authorities and private elite groups attempt to prevent popular protest by attempting to control or shut down public spaces for political groups to use. Usually historians focus on the texts and ideas of political movements in the eighteenth and nineteenth centuries. Although I’ve ‘text-mined’ the Northern Star for records of meetings in my Political Meetings Mapper project, however, I’m less interested in what they said at the meetings than what those places and spaces meant for the Chartists. As Joshua Hobson of Leeds said in 1844, (quoted at the start of my book), ‘The right to meet would be nothing without the right to speak; neither would the right to speak without the right to meet.’ For Chartists, fighting for the right to use public spaces was an integral part of the fight to be represented in parliament. Mark Crail Your book traces the gradual exclusion over many years of working people from the public spaces in which they were able to gather to protest. To what extent was this a conscious programme on the part of the state and local elites to suppress dissent, and was it unique to this period? Katrina Navickas The governments under William Pitt the Younger in the 1790s, Lord Liverpool in the 1810s and Lord Melbourne in the late 1830s all passed legislation against what they called ‘Seditious Meetings’. This was new and unique to this ‘age of revolution’. Previously, mass meetings had been seen as simply an issue about public disorder. But the French Revolution in the 1790s had a major impact, both in inspiring working people across Britain to start campaigning for representation, and in raising a reaction among the governing elite classes against the new democratic movements. The Seditious Meetings Acts of 1795, 1817 and 1819, and the Royal Proclamations against political meetings in 1839 were directly aimed at the rise of this new type of demonstration, called the ‘mass platform’. They banned political meetings of over 50 people that had not been authorised by local magistrates, and after the Peterloo Massacre of 1819, prohibited the show of political symbols such as ribbons and banners. But it should be remembered that the various governments did not conduct a ‘reign of terror’, as Pitt’s critics called it, against popular protest. They all strove to protect the ‘freeborn Englishman’s’ right to petition parliament, and there were various loopholes in the legislation of which protesters were able to take advantage. I argue rather that it was the local elites who were most repressive. It was the local magistrates, clergy and manufacturers who formed anti-radical associations and prevented political meetings taking place in their towns and villages. Mark Crail Just to be clear, you talk about “space” and “place”. Can you briefly explain the difference? Katrina Navickas Space is the physical arena in which people met and what influenced the ways in which people acted. So a Chartist defendant behind the dock in a dark court room might be intimidated by the judge sitting on a raised platform; while a group of Chartists holding a camp meeting on a hillside no doubt would have felt liberated by the exhilarating walk and the expansive views where they were not being watched by manufacturers or town police. Place is to do with people’s attachment to their localities, their memories and their histories and customs. I like the early modern historian Andy Wood’s definition of place as ‘custom’: places were defined by the customary rules attached to them, such as ‘beating the bounds’, folklore associated with particular sites and their histories, who had the right to use common land for food and fuel. While enclosure was increasingly privatizing the countryside in the nineteenth century, urbanization and ‘improvement’ was also excluding working people from their usual spaces – and consequently their sense of place – in the towns. Place is also tangible heritage. Even if people today might not identify immediately with the principles and writings of Chartism, I hope they will connect with the heritage of political sites that may still exist in their home town or village. As part of my British Library Labs project, I held a Chartist walk around Soho in London in autumn 2015, and we visited the many surviving pubs where Chartists held meetings. For many attendees, seeing the inside of the pubs and their spaces really brought the history to life. Mark Crail How important were particular venues to protest? Did people return time and again to specific locations simply because they were convenient, or was there meaning and tradition attached to them? Why was that important? Katrina Navickas Yes, particular locations were highly significant to the reform and workers’ movements. The most obvious example was St Peter’s Fields in Manchester. The first radical reform meetings were held there from 1816, and the ‘Peterloo Massacre’ of 1819 made the site into a hallowed ground, associated with sacrifice for the cause of democracy. So later political movements, especially the Chartists, always crossed St Peter’s Fields in their processions (although they rarely met there as urbanisation meant the site was increasingly too small for large crowds). This continued association by the ritual of the procession and symbolism of songs and banner slogans was important because it attempted to demonstrate that the Chartists had a much longer heritage, drawing on the ideas and sacrifices of their radical predecessors. Mark Crail I get the impression that there was little active resistance to the exclusion of working class protesters from key sites. Rather, they simply moved elsewhere rather than forcing the issue – even out on to the moors when town centre locations were closed off. Is that really the case? Katrina Navickas To an extent, yes, though Chartists in Leeds, Oldham and Sheffield were able to challenge the restrictions by getting themselves elected onto the local councils. They and the Owenite Socialists also tried to solve the problem of exclusion by building their own buildings in town centres such as the Halls of Science, though these were also contested and indeed physically attacked by their opponents. On the other hand, the tumultuous nature of popular politics in this period often involved defending the use of particular sites. The riots against the New Poor Law from 1837 onwards often centred around crowds attempting to gain access to meetings of the poor law guardians. The huge riots in Bradford in November 1837, for example, began when ‘the people became clamourous that the Court House should be thrown open and the proceedings of Guardians made public’. (Northern Liberator, 25 November 1837). The guardians stationed the military in front of the court house, and constructed a barricade across the steps. These actions prompted the crowd to assault the soldiers with showers of stones and brickbats, remove the barricade and attempt to enter the court house by the back entrance. The Riot Act was read, the military dispersed the crowd, but as soon as the soldiers left the scene, the crowd returned. The guardians and magistrates were forced to take shelter in a warehouse, and agitation continued all evening. Mark Crail Your book covers a span of 50 years, so that the main era of Chartist activism took place right at the very end of the period. Did Chartism represent something fundamentally different (in terms of space and place), or was it simply part of a continuum of radical challenge and resistance? Katrina Navickas Chartism was arguably the final wave of working-class challenge and resistance that began in response to the new ideas of democracy and the rights of man coming out of the French Revolution and interpreted by Thomas Paine. I deliberately wanted to chart the whole period (not many historians do) because I think the continuity of the aims and methods of resistance across all the successive movements is highly important. All the movements felt excluded by the loyalist reaction and all challenged the right to use public space. The Chartists, and also the Owenite socialists, however stand out because they had the longevity and financial ability to develop popular politics in creative ways. Notably, the building of their own buildings and also their attempts to get elected to local government, were among their brief but still hugely significant successes. And O’Connor’s Land Plan, again though ultimately failing, nevertheless managed to put their ideals into practice and build several settlements, which was way more than previous communitarian land visionaries like Thomas Spence had ever managed to do. Mark Crail Finally, I am definitely an enthusiastic amateur rather than a professional historian, and I enjoyed and learned a lot from Protest and the Politics of Space and Place. To what extent is the book aimed at academic or general readers? Katrina Navickas It’s firstly aimed at academic readers, as it contains a large dose of historiography and theory, as that’s the type of book academic historians have to produce for the Research Excellence Framework. However, I hope it’s not too dense, and if readers are from northern England, they will find some interesting nuggets of information about places in their home town. I’m hoping MUP will issue it in paperback so that it will be accessible to a much larger audience.